Pansy flowers grow all over the world in almost every color combination you can imagine. This flower has been called an annual, biennial and a perennial by myriads of gardeners. Pansies grow anywhere and can tolerate lots of abuse. The one thing pansies do suffer from is heat. The cooler temperatures of the northern states keep pansies growing from spring to fall while it is the winter months where pansies thrive in the southern states. The pansy seeds sold in stores are a hybrid, or F1, variety. This means two different plants were used during pollination to produce the characteristics the seedling will have, sort of like babies resembling their parents. 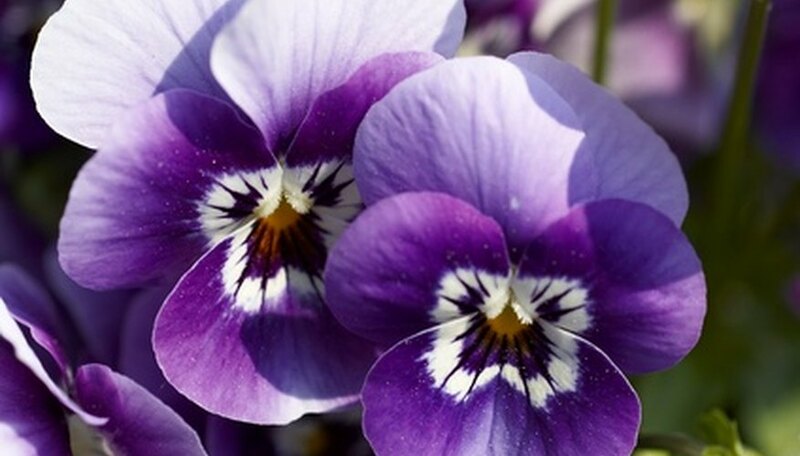 The seeds you collect from pansies bought at the garden center will not produce the same type of flowers. Specific shades and colors are best produced by purchasing hybrid seed packets and starting the seeds indoors. Pansy seeds need complete darkness to germinate. The best way to grow pansies from seed is to start with a soilless planting medium. Wet the mix to get it just moist. Pat the pansy seeds into the planting medium and scatter a handful of the medium over the seeds. Cover the growing tray with plastic or slide the entire tray into a plastic zip-top bag. Cover the tray with newspaper or a cloth. Place the growing tray into a dark area. Pansies germinate within a 10 to 20 day time frame. As soon as the pansies start germinating, remove the covering and plastic. Place the tray in a bright area but avoid direct sunlight. The heat of the sun is harmful to the seedlings. Pansies do better in cooler temperatures. A heat mat helps germination for most seeds but pansies need temperatures of 60 to 65 degrees F to germinate and grow. Pansies produce vivid colors and ample blooms and therefore must have plenty of water and fertilizer to help keep the plants healthy. Keep the soil slightly moist but not soggy while the seedlings are still in grow cells. After the plants have two sets of true leaves, transplant the seedlings into larger pots. Feed the seedlings at least twice a month during the starter period. Once you have transplanted the pansies into the garden, feed a slow-release fertilizer specifically designed for flowering plants. Dead-head the plants to keep them blooming. If you want to collect more seeds, allow the seed pod to turn brown and become papery thin before removing it from the plant. Warmer temperatures stress the pansy plants and flowering decreases. The plant tends to wither quickly during extremely hot weather. Julie Richards is a freelance writer from Ohio. She has been writing poetry and short stories for over 30 years, and published a variety of e-books and articles on gardening, small business and farming. She is currently enrolled at Kent State University completing her bachelor's degree in English.